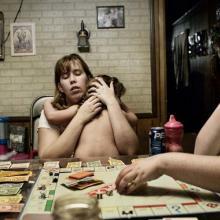 EDITOR'S NOTE: This is a controlled situation that is illustrative in nature, not documentary. Thanks for being open to this, Logan, when I saw this I was really hoping you’d be up for an interview – it’s really beautiful! Can you tell us a little of the backstory to the image. Well, first off I would like to say thank you for giving me the opportunity to do this. The backstory to this image began when my Director of Photography at The Gazette, Mark Reis, gave me an assignment a few days prior. 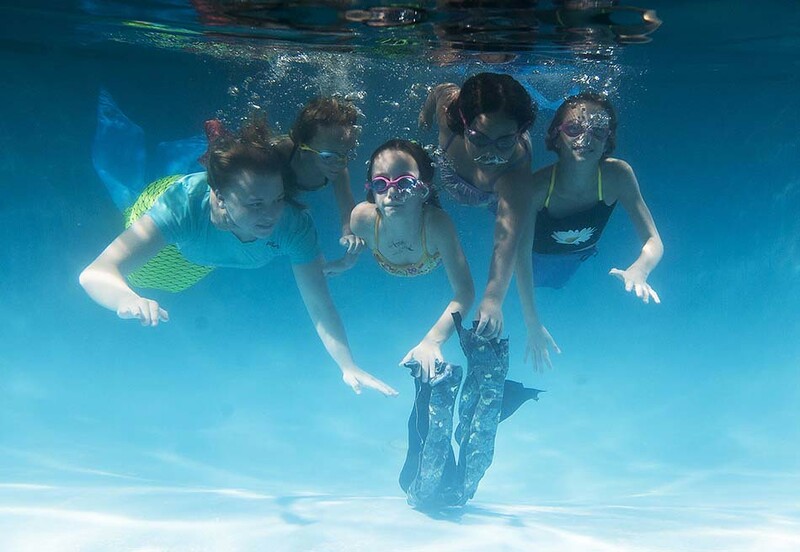 When I saw it was a story about a local mermaid swim school, I immediately knew I wanted to go underwater. 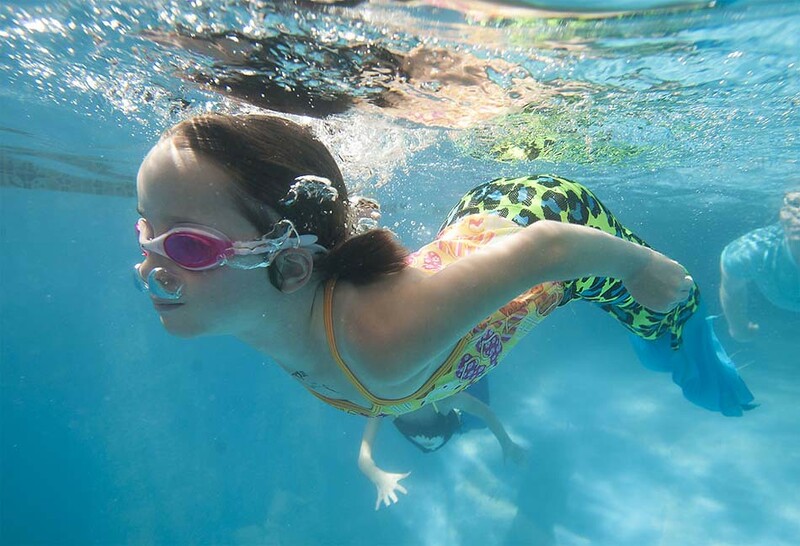 The Mermaid Swim School is a local indoor pool where little kids are given the opportunity to dress as a mermaid and taught how to swim like one. Can you talk about what preparation you did in advance? I think this is so much a part of what separates photographers from others. Additionally, can you speak to thinking outside of the box on this assignment? There are those assignments that you may get where the planning and preparation is just as much fun as actually taking the pictures. This was one of those assignments. I thought more towards a lit portrait of them either sitting on the pools edge or lying on their backs floating with their tales on in the pool. But the more I thought about it, the more fun I wanted to have with it! I remembered The Gazette had an underwater housing and that’s when I decided to go below the surface and show others what it FEELS like to be a mermaid rather than what it actually LOOKS like to be one. After I knew that I wanted to shoot underwater, I began planning for how I was going to light it and how I wanted it to look. I did not have underwater strobes, so I instead wanted to make it feel like the sun was peering through the water. 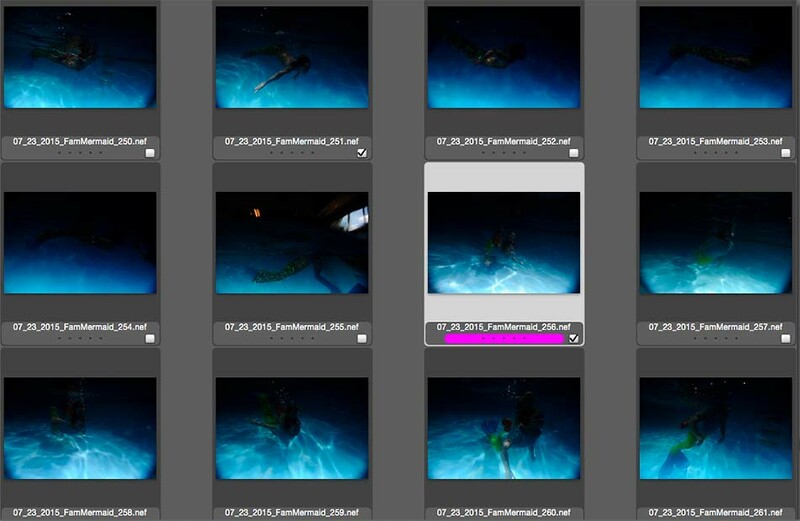 To get the shot of what it would be like to FEEL like a mermaid, I had envisioned 3 or 4 of the mermaids gliding along the pool floor swimming on their sides and backs looking up at me with soft even lighting all around. Another idea I had was to have me swim below one to show a silhouette of the tail and the body against the light from above. Unfortunately while I was thinking of different lighting techniques I realized that I had: 1. Never shot underwater 2. Never used strobes underwater 3. I didn’t know what the pool actually looked like. Even with preparation, there’s always things that pop up that you have to problem solve for. When you arrived, what did you learn that was problematic that you didn’t forsee? This was one of the most problematic assignments I have ever been on. To first start off, I have never photographed underwater. I was unsure how the light would be affected when it went through the water; how deep I would be able to go with my PocketWizards; what type of lens I should use; and lastly focusing/zooming my camera while underwater in its housing. Problem two that I noticed was how dark it was. Even I was using lights it meant that I was going to really have to push the power more than I originally anticipated for the light to reach deeper into the pool. The last problem and possibly the most difficult was how young and inexperienced the children were in the water with the mermaid tails on. A few of them had only swum once with the tails on and five out of seven girls were unable to cross the 15ft long pool in one breath. They were also unable to dive deeper than a foot below the surface. Because of this, it really narrowed my options for getting the photos that I envisioned prior to getting there. How did you overcome these problems ? I went to the pool 45 minutes before I was supposed to start shooting, in order for me to have time to set up my lights and quickly learn how it felt to photograph underwater with the housing. After setting up my lights and getting under the water, I quickly learned that I was only able to dive down a foot or so before the PocketWizard wasn’t able to signal through the water. After learning the basics of focusing and zooming with the underwater housing I focused on my lighting technique. I used two monolights – one on either side of the pool – and I faced them towards each other and I tilted them down towards to pool to give the illusion of sunlight under the water. I placed myself in the middle of the pool, between the two lights, and I first started out giving a simple instruction to the kids to go as deep as they could and try to swim under me. After the first pass I realized that they couldn’t go down to the bottom at the deeper end of the pool so I changed it up and told them to swim right at my lens. This somewhat worked and I did get an image that I liked but you couldn’t really see the tail and it did make me FEEL like I was looking at a mermaid. After a few passes I eventually turned around and stood on the ramp leading towards the shallow end. 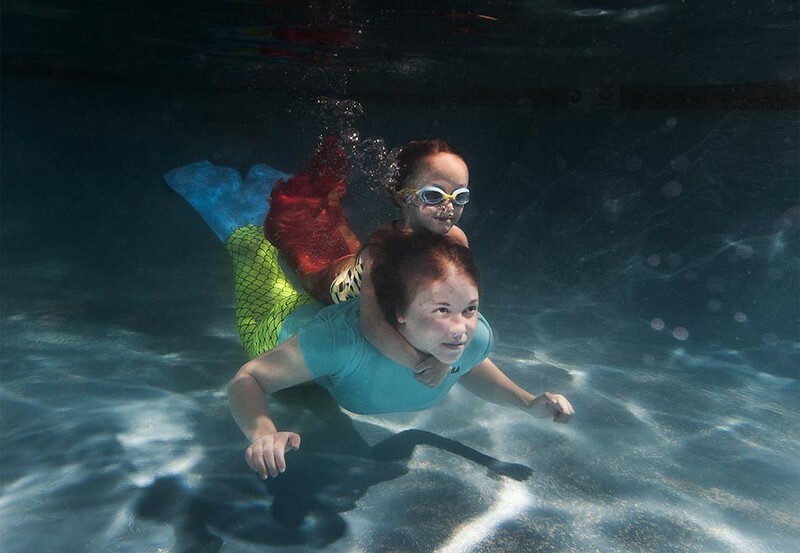 The children were getting pretty tired, from swimming back and forth across the pool so many times, that I noticed the swim instructor, Julia Mortenson, grab hold of Charlotte, who was the youngest swimmer, and place her on her back. That is when I was able to get the image that I believed gave me a feeling that I was looking at an actual mermaid. 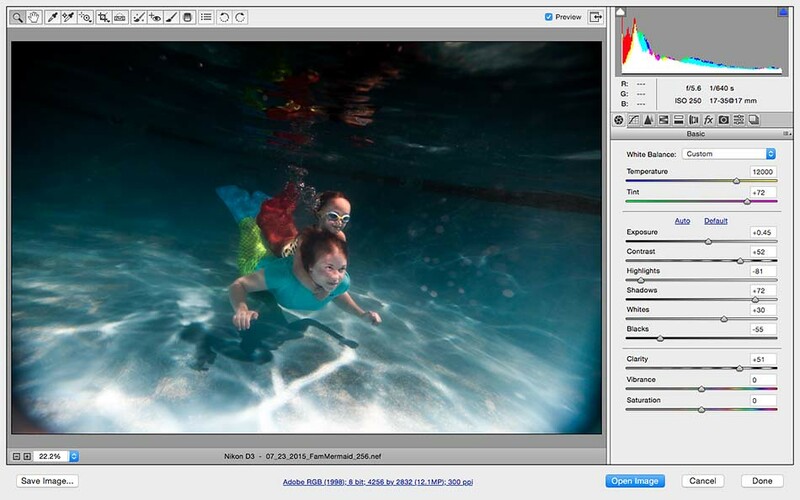 Technically photographing underwater has always been something I was interested in, but never had the means to do it. I used my Nikon D3, a 17-35mm lens and my PocketWizard TTL transmitter. Like I said earlier, the toughest part was not going too deep under the water because then the strobes wouldn’t fire. I had a lot of frames in my contact sheet that looked almost black because of the strobes not firing or they recycled too slowly. It was a lot of trial and error and I was really impressed with how patient and helpful the children were being when I was struggling with all the problems that kept popping up. I believe, however, that the work paid off. What have you learned about others from this shoot? I have learned that people WANT to help you and they become more PATIENT with you when you have a positive attitude towards them. I truly loved this shoot and I loved the interactions that I had with both the teacher and the children. However, I don’t think they would have responded the same way if I had let all the little mistakes and problems that arose make me angry and upset. Obstacles are a part of life, and how you handle yourself when they do come up is how you get better. Whether it was my goggles falling of four times, the few times I practically drowned because I went down too deep and sucked in water through my snorkel or when all the children would swim pass me and every single one was out of focus. I knew that it was counterproductive to complain, and fixing the obstacles as quickly as possible, would give me more time to find the image that told a story. Now, onto the moment. Please walk us through how you photographed it, and what was going on in your mind at the time. Key in on language (verbal and non-verbal as well) Also please discuss how you got in this position to make the frame. The moment actually came minutes before they went underwater. When I realized they were getting more and more tired, I instructed them to move to the shallow end of the pool to make it easier to stand. While I was figuring out what to do next, I saw Julia, the instructor, grab hold of Charlotte, who was too tired to keep swimming, and put her on her back. 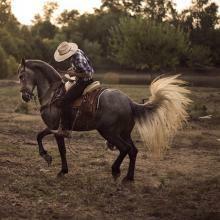 And being a photojournalist you know could be a great moment and so I began to focus on them. I instructed them to swim past me on the right hand side, pointing to where they should dive down in order for the lights to hit them. I told Julia to “skim the bottom of the pool” and I told Charlotte to “hold your breath as long as you can.” As soon as they went down I locked my focus and shot off a few frames. Looking back at them afterwards while in the pool, I thought they were too dark and I missed the moment. Thankfully I shot RAW and was able to bring most of the information back but at a first glance I assumed I missed it and with time running out I needed to try something different because all I had shot previously were them swimming underwater. You’re still young in your career, what have you learned broadly so far since graduating from school (using this assignment as an example)? I had the pleasure of getting coffee with Bill Luster who was a staff photographer for The Courier-Journal for many years. He gave me a quote that I have continued to live by going into my senior year. “Don’t try to be a great photographer at one specific thing… Instead be a good photographer across all types of photography.” This was a profound saying and it stuck. Throughout my college career I have used that saying to help try and make me the most well rounded photographer I can be. This assignment was a great example of slowly becoming the most well rounded photographer that I can be. This assignment has shown me how different genres of photography came together to make a single image. I had to use my knowledge of peak action from sports and I had to understand lighting techniques to give it the effect that it does, putting my knowledge of both genres gave me the ability to achieve this photo. Advice number one for fellow photojournalists is to become just as much a problem solver as you are a photographer. Learn how to cope with mistakes and adapt to a situation on your own instead of wondering what to do. Take action! I am not saying that you will be able to fix every problem that comes up but through failure comes knowledge. Another piece of advice I feel like sharing to other photojournalists and photographers in general is to try and make each assignment more unique than the last. Whether it is popping a strobe, using a different creative device that you never thought to use, or even going underwater, finding personal motivation to make yourself better is a tough obstacle to learn. However, if you push yourself to find something creative in the things you thought were dull, that is when beautiful work is created. And lastly, my father has always taught me to practice with a purpose in life. Whether it was in sports, academics or in photography; he told me that if I didn’t go practice without thinking about something that I needed to work on then it was a waste of time. When I go to work everyday I constantly think how I need to make myself better and in what ways. Is it in portraiture? Sports? Spot news? Whatever it may be, find a purpose for going into work because if you don’t then why bother going at all. 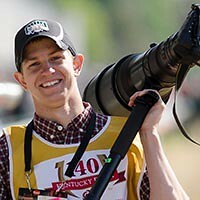 Riely is in his senior year, majoring in photojournalism at Ohio University. After his freshman year, he interned at Power Creative Advertising Agency and learned from Pulitzer Prize winner Dan Dry and his crew of photographers about lighting inside and outside of a studio. He attributes a lot of what he know about lighting from them. Last summer, he had the privilege of interning for The Columbus Dispatch in Columbus, Ohio, and most recently finished interning at The Colorado Springs Gazette. Riely was awarded a bronze medal for his sports portfolio by College Photographer of the Year as a sophomore, and most recently was awarded Ohio Student Photographer of the Year by the Ohio News Photographers Association. He is currently the Vice President of the National Press Photographers Association Ohio University Chapter.